This academic course focuses on Hebrew as the source language of the Bible. The translator is also introduced to the context of the Bible, the land in which was written. 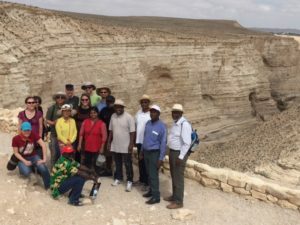 This unique combination equips translators to provide a more accurate and natural translation into their own mother-tongue as the target language The program has been offered in conjunction with the Rothberg International School for Overseas Students of the Hebrew University since 1995. Instruction is offered in alternative years in English or French. 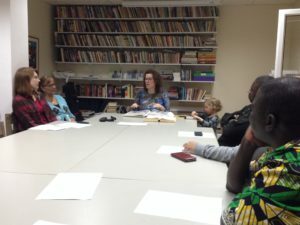 The student is challenged to begin learning Hebrew as a living language via instruction in Hebrew which aims to enhance the development of both spoken and written language skills. Along with traditional approaches, this intensive course is enhanced by innovative study methods, including audio and video learning tutorials in a University language laboratory setting. Internalization of Hebrew vocabulary and grammar is encouraged through hearing, speaking, reading and writing Hebrew. This immersion approach leads to long-term retention of vocabulary and verb forms. The instructor, Eyal Nahum, is an experienced Hebrew teacher. 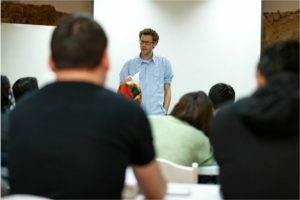 After having taught Modern and Biblical Hebrew for a number of years, Eyal has developed his own materials for teaching Biblical Hebrew using a similar methodology to that of the Modern Hebrew Ulpan at the Hebrew University of Jerusalem. He uses modern techniques for rapid language acquisition as applied to Biblical Hebrew. Eyal has been teaching Biblical Hebrew for 6 years using this new method. Classroom instruction and interaction is conducted in Biblical Hebrew. This allows students to internalize the language by building both their memory and their analytical skills in the language, by exploiting all four of the major language skills: reading, listening, speaking and writing. The book to be used in the course (“מבראשית”) was written by Eyal Nahum and is the fruit of many years of teaching Biblical Hebrew as a foreign language. Instructor: Eyal Nahum, native Israeli, MA in linguistics (Hebrew University). Extensive readings will focus on the the full verbal system and syntax. This course will be taught by an experienced senior Bible translation consultant. The instructor will introduce discourse analysis related issues in the text, teaching how to identify and interpret the discourse structure of Hebrew texts. The instructor will also discuss methods of exegesis and principles of Bible translation. This practical course aims to give students an increasing appreciation of how Hebrew poetry works and to help them develop their skills in unfolding the layers of meaning embedded in the artistry of many Biblical poetical texts. The students will learn to discover the Biblical world of the authors and their original audiences in order to read the texts through their eyes. Classes will demonstrate how to analyze and synthesize a variety of biblical poems and students will practice applying these principles and procedures to many assigned poetical texts. This course will also be taught by an experienced senior Bible translation consultant. 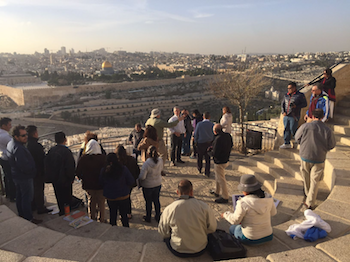 This course involves extensive travel to Biblical sites where texts are read on location. It is a learning experience that cannot be replicated anywhere else in the world! It serves as a visual experiential dictionary of BH words and concepts, of BH similes and metaphors. 2. 40 hours of lectures are organized under three main topics: geographical regions, historical periods and cultural issues. A Certificate of Completion is presented by the Rothberg International School, Hebrew University of Jerusalem to each participant. Students get official transcripts from the university. The credits are transferable to universities abroad. Click here to see the high level of professionalism and experience of our instructors over the years. Successful completion of a JCBT Biblical Hebrew exam. The exam requires knowledge of the strong verb system, basic grammar and the 300 most frequent words of the Hebrew Bible. 70% required as passing grade to become a potential candidate. NOTE: JCBT reserves the right to make exceptions. A print-friendly PDF document of the Semester Program is available here. Costs for the Semester Program are discussed here.